To look at me, I would be an unlikely candidate for someone to give dieting advice. But hear me out. I have a slow metabolism and a sedentary job. I have three and a half kids (aka one on the way!) and a professional life that keeps me hopping. Hopping metaphorically, that is – in reality I have a very hard time finding space for exercise, and stress-eating is my way of coping with the ever-present stress. Looks can be deceiving. The following is actually not a diagram of the Canadian Dollar: but my progress so far in this diet. This is the second time in my life I have undertaken a major diet, trying to drop 30 pounds or more. The first time, when I lost 40 pounds in the summer of 2008, some people asked me how I did it. I wrote up a blog post at that time, but I’m glad I never posted it, because I did everything wrong. I tanked up on sugars, fasted for long periods of time, and basically only lost weight because I had a super active job. It was an excruciating diet, with frequent headaches, fatigue, debilitating cravings, etc. which is why when Christmas rolled around and I just couldn’t control myself, all my hard work came crumbling and jiggling apart. After gaining, then holding steady for a few years, I recently went through three years of transition and stress that packed on 30 pounds in all the wrong places. That’s the bad news – the good news is that I started a new “diet” last December, and half of that is gone already. The rest is steadily (not quickly, but steadily) melting away. And the very best news? I’m not eating anything really different, or exercising much. I’m not putting up with huge cravings like I did last time. I don’t turn down food at friend’s houses (sometimes I pass on desert) and I live my life pretty normally. How do I do it, you say? Your mindset is huge. Weight touches us deeply, especially if we have ever been insulted for our body image. And we can have all sorts of negative reasons for wanting to diet. Before I started this diet, I did a google search on motivating one’s self to diet. (The flesh was willing, but the spirit was weak). I found an incredibly helpful tip, from FitnessMagazine.com. The big idea is this: do not motivate yourself by what other people want from you. Write out the reasons you want to loose weight. Lose weight for yourself, not for others. This was huge for me. I realized that I often pushed the responsibility for my weight-loss onto my wife, asking her to “keep me accountable.” That sounds like a good idea, but when I wanted goodies, I would find myself trying to sneak them behind her back, and sometimes even secretly resenting her for being the “calorie cop.” She wasn’t enjoying being in the role either, and it sometimes caused tension in our relationship. Ultimately, it wasn’t very helpful as a long-term motivator as she or I or both of us tired of the roles. A better plan is to make a list of why you want to loose weight. Here is my list. You’ll notice that none of those things have to do with other people putting pressure on me, or measuring up to anyone’s expectations. It’s about me, what I want for myself. And that’s important. Because when I want a chocolate muffin, I can remind my self that I want something better. That works much better than external pressure. Just a few basic things you already know. You eat food, and it turns into sugars. 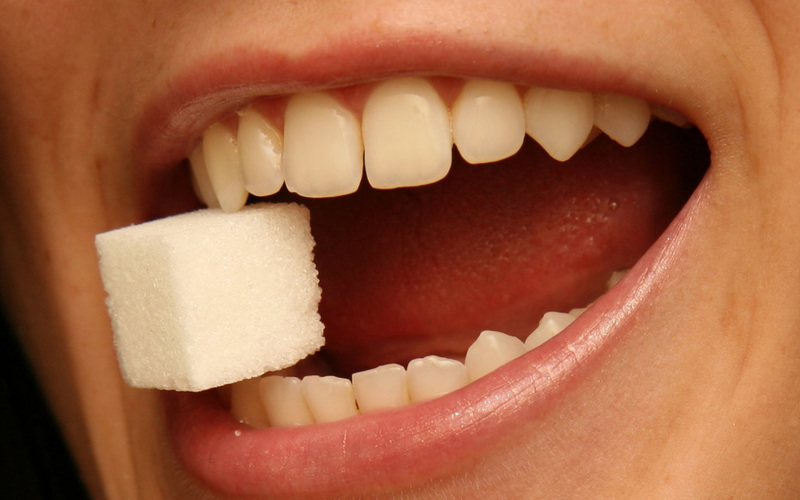 Your body burns these sugars to keep you alive, thinking, and strong. But it cannot handle a big burst of sugar all at once (unless you are sprinting from a bear, in which case a Mars bar might be an excellent snack of choice). When we eat our over-processed, sugar-rich foods, our body responds in two ways: 1) it turns sugars into fats to be used later, 2) it produces insulin to pair with the sugars and take them out of our blood, 3) if we give our body a significant sugar spike (which happens very often, in our diets) our body will overproduce insulin, leading to a let-down period of low-blood-sugar. This is why you often feel hungry an hour after eating Chinese foods: the sugary sauces made a sugar spike, which made an insulin spike, which now leaves you with low blood sugar. Ironically, even though your digestive tract is full of great food, your blood-sugar level is low, and so you want to munch. Avoid white bread/white flour products. I know they’re everywhere. But white flour has been so refined it turns to sugar almost as soon as it hits your stomach acid. White flour is your worst enemy. Replace with whole-wheat options, if you can. Brown is better, but not good enough. Most brown bread is white flour with about 20% of the bran (the shell of the grain) put back in. This helps, but is not enough. You will still end up with a sugar spike (albeit a slower/lower one) if all you eat for supper is brown spaghetti/rice/bread. You need to pair your carbs with other things, and basically reduce at all costs your carb consumption. Pair sugars & carbs with other foods. A steak or cheese will slow down the sugar spike from a slice of bread. Of course, many protein foods are high in fats, so one needs to be reasonable! Don’t eat calories when you don’t need them. It has been said one should eat breakfast like a king, lunch like a prince and supper like a pauper. So long as one doesn’t take that as an excuse to over-eat two meals of the day, there is a lot of truth here. And we aught to add: don’t have big late snacks either! Don’t eat more calories in a day than you burn. Find an app to track your calories and exercise. If you burn more than you eat, you will lose weight. It’s as simple as that. I promise I am not selling this app, nor am I getting a royalty from it! But it has worked for me, and so I have been known to talk at length about it to anyone who will listen! This is a simple app that can quickly enter the calories of your foods (using a bar-code scanner, or manual input) and calculate calories. You can also input calories burnt in exercise (it measures foot-steps automatically) to tell you how much more you can eat that day, to stay under your goals. You can find friends on here (it’s a very popular app, and you’ll be surprised how many of your friends use it) if losing weight publicly motivates you. If not, you can keep your journey private. What I did is track myself religiously for about ten days. I input all foods, all exercise, and weighed myself at the same time every day. In that time, I saw about five pounds fall off, which was encouraging. It was a time-consuming process, and thus unsustainable: but in that amount of time I got a pretty good idea of what amount of food I could eat in a day to stay under my limit. 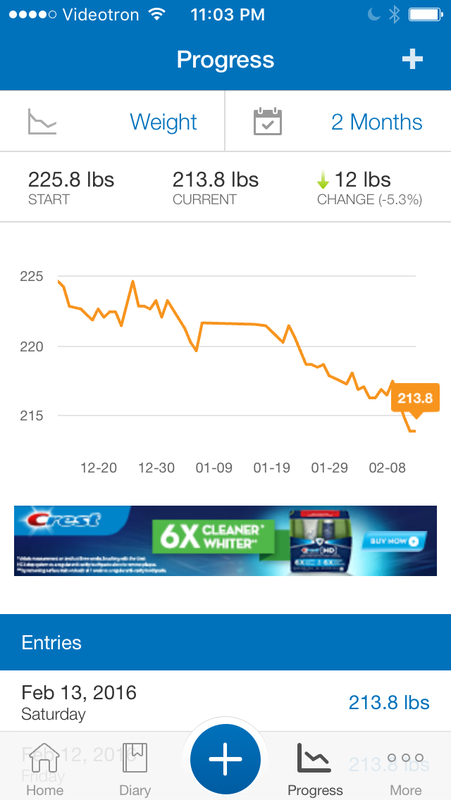 I now just use the app to input my weight. Because I know what to eat to stay under my calories, I keep losing weight at a sustainable and healthy rate of about two pounds a week. The only supplement I take is PGX Daily. I actually took this way back when I did my “crash diet.” It really seemed to help back then, but I didn’t know what it was, or what it was doing. This time, I actually talked to a nutritionist before starting my diet (always a good idea!) and she told me the pills are basically just fibre packed into a small package. When the coating dissolves, they absorb water and fill up your stomach. They also bind with the sugars, to slow down digestion and avoid sugar spikes. She said I could take two before or with meals three times a day, or when I craved a snack. They’re a bit pricey, but when you compare it to the price of hiring a nutritionist, or the long-term costs of being over-weight…. As my diet is progressing, and I am getting more used to a reduced diet, I am finding less and less of a need for them. I suppose I should throw in here also that it’s always good to be taking a good once-a-day vitamine. Sometimes we crave foods because we are missing nutrients: so a pill can keep us a bit more balanced that way. There are a few foods I go back to again and again. Second, I usually have a salad for lunch. This one is kind of a no-brainer, but you can add a lot of interesting options so your salad isn’t too repetitive. If you’re real serious about weight-loss, you can substitute salsa for salad dressing, as it has a lot fewer carbs. Throw on some cottage cheese, eggs and cheese for protein. Sometimes I eat salad with cold spaghetti sauce. It’s not as weird as it sounds. Third, suppers I eat with my family and usually try to eat “normal food.” If I have kept an eye on my calories throughout the day, I can afford to eat a normal portion of whatever our family is eating at the time. This is a real advantage of my current diet: I don’t have to ask my wife (or people inviting us over) to modify their cooking to my diet. A really simple go-to food is boiled eggs. But you knew that already. Boil some and have them on hand for snacks and cravings. If you find them too dry, try under-cooking them a bit. (Not soft-boiled, just a little moister. you’ll be glad you did!) They’re still 80 calories each, but they have a lot of protein and fill you up quick. Another easy food is pickles: not the sweet ones, just the dill pickles. 8 calories a pickle. Eat as many as you want! I don’t think I need to tell you that snacking on veggies is a good idea, do I? Just avoid “root veggies.” Sorry, carrots aren’t the best choice. You’ll notice they are quite sweet to the taste, because the plant is storing up calories in it’s root (actually a tuber) for hard times. Reach for above-ground types of veggies if you can afford them! Finally, a discovery I am particularly proud of is my 0 calorie Cranberry Juice. Simply buy some 100% pure cranberry juice at a health-food store. You can usually get it for $7-$9 a bottle. Mix in some stevia powder (if you don’t know what this is, you should find out. It is an all-natural sweetener with no calories. only a mild minty aftertaste that doesn’t go with everything). Keep the mixture in the fridge. When you want a glass of something, mix about 1 part cranberry/stevia with 6 parts water. It’s a refreshing, tasty drink that is full of vitamins and anti-oxidants, but has virtually no calories. I often drink it with a PGX pill or two, and feel quite full after. If you like the bitter taste of coffee, but find it keeps you up if you drink it too late, this cranberry juice could be just what the Dr. ordered. Good luck, and here’s to a thinner, healthier you! Augustine on "Why Do Bad Things Happen To Good People"
Very good article Josiah! It seems like you have cracked the code!